Like a host of other Italian libretti of the period, Romani's libretto for Donizetti's L'elisir d"amore was the result of an adaptation of a pre-existing French source – the rather slight text by Scribe for Auber's Le Philtre - to which it famously adds considerable pathos and lyricism. Farcical lightness and genuine expression of heartfelt emotions are, in this Romani-Donizetti opera, intimately combined, accounting for a patchwork of dramatic moods running the gamut from comic swindling to sincere yearning for love. Most importantly, L'elisir presents the transformation of some of its characters before our eyes and ears: Nemorino and Adina, in particular, lose some of their initial hesitancy and coquettish snobbery respectively: the lad gaining in self-confidence and his lover-to-be becoming more emotionally engaged. Needless to say, all of this is primarily conveyed musically, with Donizetti hinting at the sheer multidimensionality of the upcoming action as early as the rapidly unfolding, contrast-based prelude. In the current Royal Opera production, co-produced with the Opera National de Paris in 2006 and now in London for the third time, French director Laurent Pelly (Daniel Dooner for the current revival) provides a visually charming and at times tremendously entertaining take on the opera. Set in a rural Italian village of yesteryear – some time around the 1950s or 1960s in general opinion, but according to Pelly simply in "Italy" or the world of childhood memories – the action mostly takes place at the back of a bar trattoria alongside a (busy) country road. Bikes, Vespas, tractors and lorries, as well as a plethora of people in peasant dress and the odd specimen of four-legged country life continually crisscross the space, whether passing swiftly or indulging in stage business. One can hardly overlook, in the circumstances, the bar's name: dell'incrocio ("of the crossroads"). This open area (representing, perhaps, that most Italian of social spaces, the piazza?) – as well as its initial, if diametrically opposite, counterpart, an overpowering pyramid of hay bales – provides the frame for a number of inspired comic moments. Such as when Nemorino (Roberto Alagna), at the end of the cantabile of his Act I duet with Adina (Aleksandra Kurzak), declares he"s ready to die, throwing himself to the ground before her revved up scooter (a few moments later even, unsuccessfully, trying to jump on the back). But if Pelly"s staging is nothing short of extraordinary in terms of comic fervour, it proves less convincing when it comes to delivering the more lyrical moments of the score (helped, to this end, only by the occasional dimming of the lights at such crucial moments as Nemorino"s "Una furtiva lagrima"). In the current revival, however, the director shares responsibility for this shortcoming with, at the least, some of the principals. 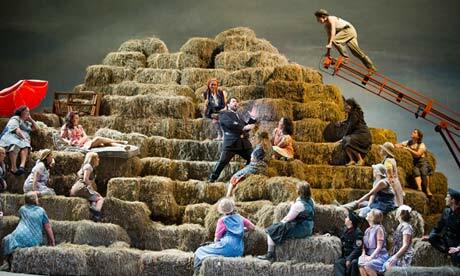 Alagna, the star name of this cycle of performances, was big – perhaps far too big – in both vocal and dramatic presence. He sang his role with a resonant, vibrato-rich voice almost throughout, at the risk of sometimes pushing too hard and turning throaty. His muscular acting and energetic vocal delivery were spot on in most of Act II, but he could have held back somewhat when still the melancholic, yet-to-gain-confidence Nemorino of Act I. Because of this uniform vocal colour, even his delivery of the touching romanza "Una furtiva lagrima" in Act II, in which the tenor did sound appropriately poignant, lacked some of the larger sense of emotional direction that the piece's minor-major oscillations invite. As Adina, Kurzak grew increasingly stronger, gaining, as time passed, some of the vocal power that she seemed to lack at the opening. She dispatched her coloratura passages with precision (if not always clarity of diction), although her attention to phrase-by-phrase expression sometimes came at the cost of withdrawing the musical flow on the larger level. Fabio Capitanucci, as sergeant Belcore, delivered a good performance, but he often lacked, both vocally and dramatically, the persuasive commanding presence his role demands. Last but not least comes Ambrogio Maestri, who, as travelling quack Dulcamara, stood out with his never-over-the-top yet always confident acting and artful buffo patter. In the pit, Bruno Campanella overall infused Donizetti's music with enough pace, particularly in the ensembles. All that was missing in this performance was a bit more of that emotional variety and momentum that the composer and his librettist first envisioned.